Cursed gets its UK release today, hooray! It’s amazing how fast you get used to these. For the release of Fated I was really excited. For this week, though, I’ve been so busy working on Alex Verus #4 that I’ve hardly been paying attention to Cursed at all! Still, seeing it out is pretty satisfying – and the cover is just as good as ever. Cursed is just bloody exciting. It is filled with action, magic, and assassination attempts. Readers will be drawn in and unable to escape until the final page. The characters (especially Alex, Sonder, and Arachne) are all well written and complex . . . Cursed is exactly what I wanted out of it. Jacka lays another strong foundation for this fledgling series that has the potential to become something huge. Benedict Jacka is currently two-for-two . . . One of the great things about “Cursed” is that while Jacka is clearly building toward an overarching big picture story, the short-term story arc doesn’t suffer. Truthfully, a reader could pick up “Cursed” without having read “Fated” and not feel that they’ve dropped into the middle of something. 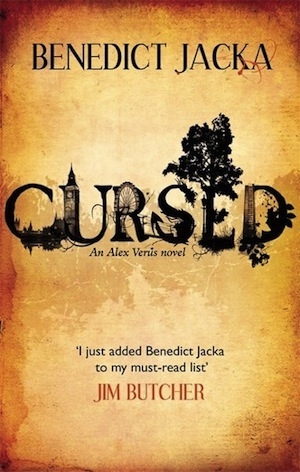 That said, any fan of urban fantasy – or fantasy in general – would be well-served to fully invest in Alex Verus and Benedict Jacka. The payoff will be worth it. I think I liked this one even better than the first, but that’s really no surprise. I’m now settled into this world and have a good idea of how things work and how Alex thinks as well as how his abilities work . . . If you haven’t yet started this series I highly recommend you do so as you are certainly missing out! Fast-paced, action-packed and full of adventure and magic – Cursed is a fantastic sequel. In fact, I enjoyed this thrilling story even more than the first. This series is a must-read for urban fantasy fans. Dark and suspenseful, with plenty of mystery – Jacka does not disappoint in this sophomore novel. Tomorrow will be the next part of the Concord series on the Encyclopaedia Arcana, so check in for that too! 2 Responses to Cursed UK Release Day! Oh, really? I’ll try and find a copy!